According to the National Conference of State Legislatures Spring Budget Update, 34 states are on track to meet their budgets. Nine are expected to have surpluses, and seven may come up short. A majority of states will meet their budgetary goals for FY2014, according to a report released by the National Conference of State Legislatures (NCSL). 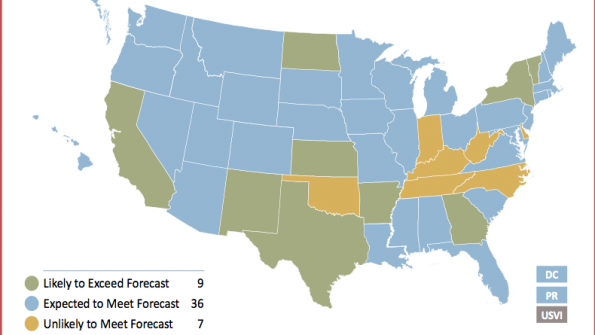 34 states, Puerto Rico and D.C. are expected to meet their FY2014 revenue estimates, according to the report. Nine states are expected to have surpluses, and seven may come up short. The Washington Post notes that the NCSL report is based on interviews conducted through March, so recent developments in certain states were not reported. The paper reports that due to recent financial developments, Kansas, New Jersey and Pennsylvania may yet go over budget. The report also notes a growing number of officials are concerned with long-term structural imbalances, where ongoing growth will not keep pace with set expenditures. Some states project such structural gaps as early as FY2016. More states see potential problems in FY2017 and beyond. Read more about structural imbalances, particularly as they pertain to the corrections system here, or download the NCSL report here.